The new Ford C-MAX cars are leading the charge to win market share from Toyota and Honda with a new line high fuel efficiency vehicles, and in November the company racked up its biggest month of electrified vehicle sales ever. Ford isn't just making electrified vehicles for compliance with regulations, instead the company has a proper long-term strategy to gain market share and to get ahead of the regulations. On Friday, Ford reported an early sign of success saying that November appears to be their strongest month ever for hybrid vehicle sales, besting July 2009's sales record during that summers' Car Allowance Rebate System (a.k.a. Cash for Clunkers) federal program. Ford's new sales record will be above 6,000 units and represent an 11 percent market share in electrified vehicle sales. Ford is in this to beat Toyota and Honda for market share, and the company touts that their new electrified vehicles help Ford beat Toyota in fuel economy in every segment where both compete. This fall Ford is rolling out a variety of five new electrified vehicles, the C-MAX Hybrid and C-MAX Energi plug-in hybrid, the Focus Electric, and the Fusion Hybrid and Fusion Energi plug-in hybrid. Together these form five prongs of a strategy to win market share while increasing the companies overall fleet average fuel efficiency. 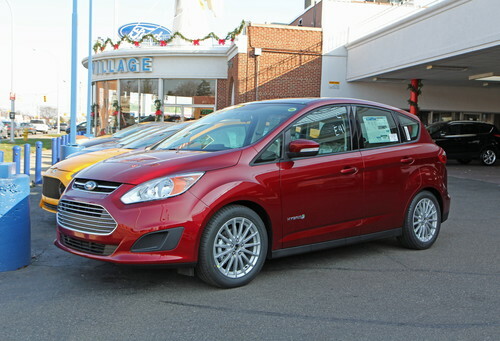 The two C-MAX vehicles are Ford's first hybrid-only vehicle line, and come in two flavors. The C-MAX Hybrid which is a "normal hybrid", and the C-MAX Energi, which is a plug-in hybrid. They are new to the U.S., but have been popular in Europe for a few years now powered by gasoline or diesel. During the first full month of C-MAX sales in the U.S., October 2012, C-MAX Hybrid outsold Toyota Prius v, 3,182 units to 2,769 units. The C-MAX's are similar in size to the Prius v, making that a fair comparison. Ford projects sales of over 4,400 C-MAX's in November. Ford's dealers are telling the company they cannot keep the Fusion Hybrid and C-MAX hybrids in stock, and these are the fastest selling cars in Ford's lineup. The Fusion Hybrid is selling more quickly than the non-Hybrid version. On average the Fusion Hybrid's are sold within 7 days, while the non-Hybrid version turns over in 12 days, and 27 percent of all retail orders for the new Fusion are for the hybrid model. The 2013 Ford Fusion line will be the first of Ford's automobiles to receive the full treatment. The "conquest rate" is the percentage of new car buyers who trade in a competing brand vehicle to buy a Ford. For the C-MAX's, the conquest rate is 64% with Toyota and Honda being the most traded-in brands. Toyota Prius is the No. 1 competitive trade-in vehicle, followed by Honda CR-V. The C-MAX Hybrid is projected to achieve 47 miles/gallon city fuel efficiency, at least 3 MPG better than Toyota Prius v while offering more performance. These five electrified vehicles are an early stage of a long-range strategy on Ford's part, called "The Power of Choice." What this means is that car buyers are being given a new kind of choice in car purchases. There have always been a dizzying array of vehicle choices, but one key critical choice was forbidden from car buyers. The choice of drive train. You had a choice of engine size, or a choice between gasoline and diesel, but you could not choose electric or electrified drive trains, that is until the rise of the Hybrids 12 years ago. Ford's idea is to build each vehicle so that the drive train is another choice you make during the car purchase process, and the factory simply installs the buyers preferred chosen drive train. "and the company touts that their new electrified vehicles help Ford beat Toyota in fuel economy in every segment where both compete" Except that the EPA MPG estimates of the C-max are inflated(47/47/47). The C-max plug-in hybrid is EPA rated for 41/43/42 but the only difference is about 250 pounds of batteries in the back. A fat person in the back of a car shouldn't affect MPG that much. So, the regular C-max should get near the same rating as the C-max plug-in, but doesn't. The average real world MPG for the C-max is about 38.5MPG on Fuelly and about 41MPG on Fueleconomy.gov. The average real world MPG for the signifiantly larger Prius V is 42.5MPG on Fuelly and similar on Fueleconomy.gov even though it's only rated for 40/44/42. I have been driving my C-Max for about 2000 miles. The actual mileage (gas used vs mileage driven) has been 41.5 for all driving. I have always gotten better than EPA estimates in the past, but do not expect to achieve 47 MPG under any circumstances. I really like everything about the car and I am happy getting 41+ MPG. Truth in advertising seems be something from the distant past in ALL areas of sales these days. Not sure what you mean by "real world MPG": Volt owners I've talked to are consistently getting higher than the MPGe rating of their cars. Mitsubishi Outlander PHEV .. due to be available in a couple months http://www.torquenews.com/1075/mitsubishis-outlander-phev-worlds-first-plug-hybrid-suv I do agree, it's weird that the car companies are focusing on electrifying small vehicles that are already efficient. They'd get more bang for the buck in electrifying larger vehicles.